On Saturday July 9th, artists Nate Dorr and Maya Edelman will lead a day of public events as part of Chance Ecologies: Flushing River. This six-week-long artists residency is located at the Studio In The Park, adjacent to the Queens Museum. 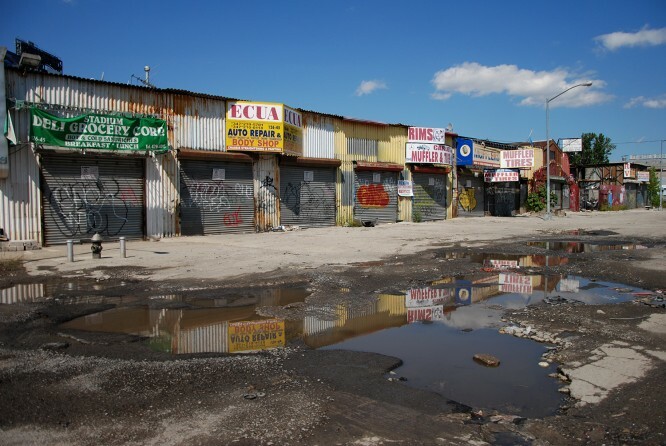 Starting off from the Studio In The Park, photographer Nate Dorr will lead a journey to the mouth of the Flushing River in Willets Point, Queens. Long a grittily vibrant local center for autobody shops and scrap-yards, much of this “Iron Triangle” now lies abandoned, following city buyouts and relocations for a planned redevelopment of the entire neighborhood. Particpants will walk through the neighborhood’s pitted streets, observing the transitional phases of an area where alternate blocks may be utterly vacant and slowly returning to nature, or still humming with human activity. Located adjacent to the Flushing River, the streets here flood often, and on the far side of Willets Point, the walk will reach the mouth of the Flushing River, where a post-industrial shoreline has been reclaimed by marsh grasses and other wild-growing plants, beneath highway overpasses. Artist and animator Maya Edelman will lead a public workshop at the Studio In The Park, examining the evolution of the salt marsh and woodland habitats of the Flushing River. Using a variety of cut paper techniques, participants will reconstruct the various naturally occurring flowers, ferns, and grasses that currently live along the river, and will also draw from the NYC Parks’ Native Species Planting Guide to examine the species of plant life that might have once thrived in this area. During this hands-on, creative workshop, participants will also discuss how both “native” and “non-native” species have found a home in Queens, and which plants might survive along the Flushing River into the future. Finished paper plants will be ”replanted” in Willets Point the following day, for a stop-motion animation film.